On Good Friday all four of us got together for a relaxed but still rewarding day of birding down in Newell County in the vicinity of Brooks. With Phil at the wheel today, we set off from Calgary at 6:30 a.m. and made it back into town just barely in time for supper. Actually in my case, I arrived at the same time as our dinner guests which was rather bad form but they're good friends and hopefully forgave me! Winter's blast of the previous day seemed to have dispersed the birds a bit because it seemed to us that the number of ducks, geese and swans was lower than we had expected. Nevertheless, there were still enough of them around to make it feel like Spring and the weather was cool but pleasant with relatively little wind. By day's end we had seen 54 bird species and 4 mammal species including a handful of new team birds for the year. 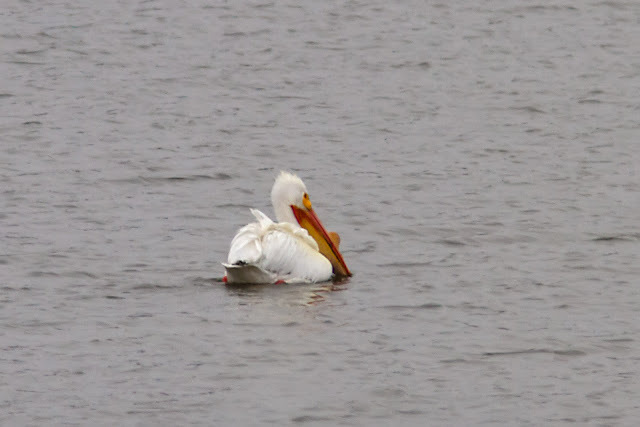 We saw two American White Pelicans today, the first being just northeast of Brooks. We drove southeast of Brooks to Tillebrook PP where we spent a half hour or so. The highlight here was a Fox Sparrow and we had excellent though fleeting views of this bird. Our Alberta Fox Sparrows are a very different subspecies from the Fox Sparrows seen on our recent Fur & Feathers trip to B.C. and far less frequently seen here too so this sighting was a real treat! We also spotted two Townsend's Solitaires here. 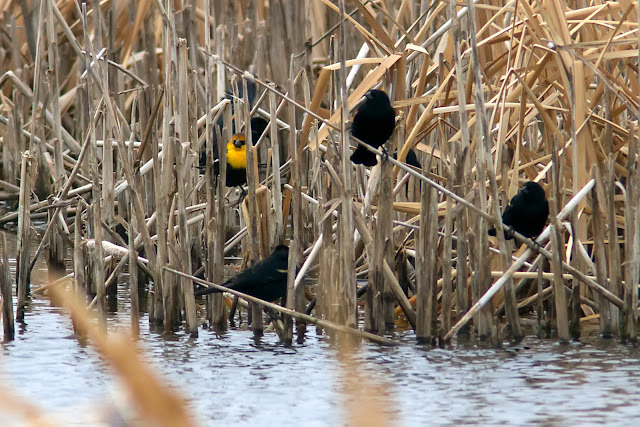 We continued east hoping for, but not finding, a Burrowing Owl but at Bantry Reservoir we came across a brightly coloured male Yellow-headed blackbird in the company of about 20 or so Red-winged Blackbirds - our second new year-bird for the day. Shortly after our visit to Bantry Reservoir we circled back east and south, coming across a few interesting sightings along the way including a single Snowy Owl and a small group of about 10 Snow Buntings. We encountered several Common Grackles too which was our third new year-bird for the trip. Mike and Brian had made a trip to southeast Alberta about three weeks ago so Phil and I were in catch up mode on a few species. One of these was Ferrugionous Hawk and we saw three of them in the area. I hasten to confess that I took this picture - not Brian! His standards are much higher! 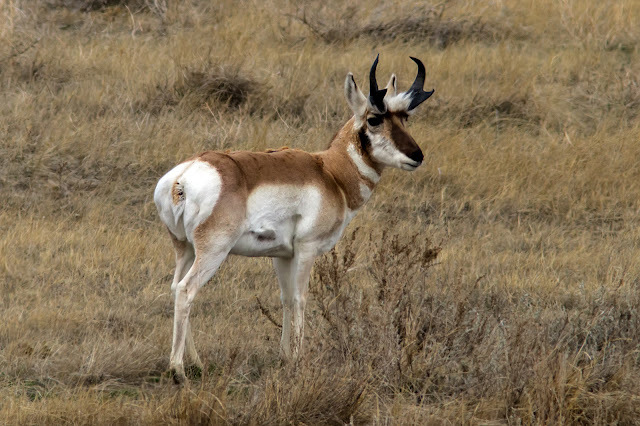 We continue to find mammals hard to come by, but we saw four of the more common ones during the course of the day: Mule Deer, Richardson Ground Squirrel, Pronghorn Antelope and Muskrat. The Pronghorn Antelope was another catchup species for Phil and I. Surprisingly, this was the only one we saw all day long. What a great feature of the landscape these creatures are in SE Alberta! 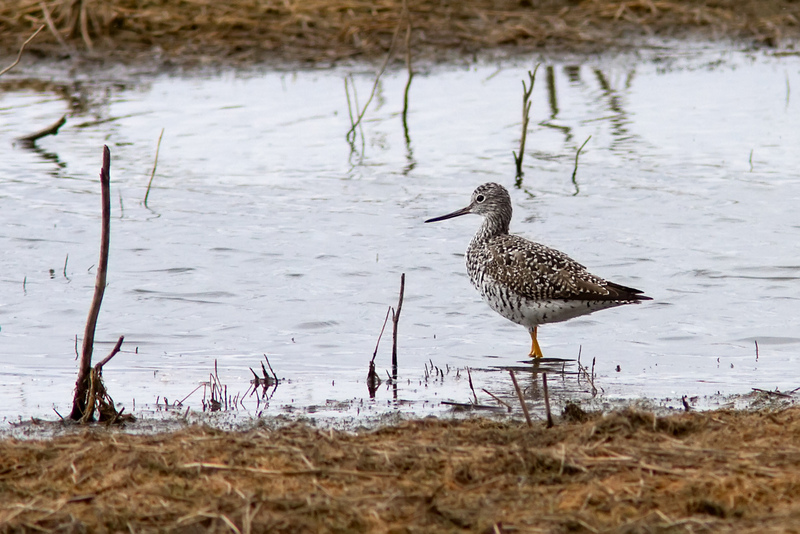 We saw very few waders today! By April 6th one would expect to do a little better but Killdeer and Greater Yellowlegs (3) were our only sightings. Maybe we're just becoming a little impatient which is a common failing of birders in early April in Alberta! We shouldn't really rush the season should we? 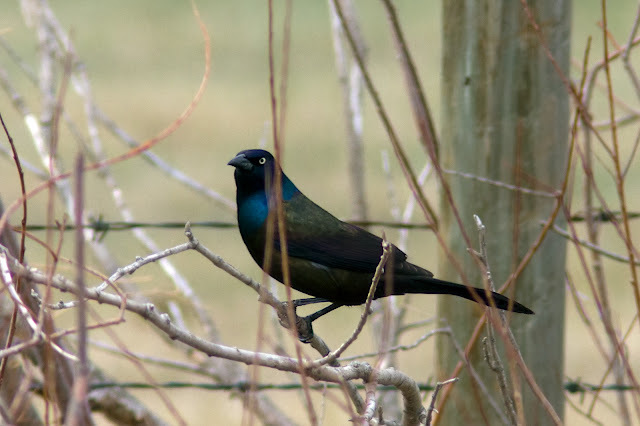 Time passes all too quickly and spring migration will be over soon enough! On our route home we stopped at Namaka Lake where bird numbers and diversity seemed every bit as rich as Brooks! The highlight perhaps was 8 Greater White-fronted Geese which was a catch up species for Phil. 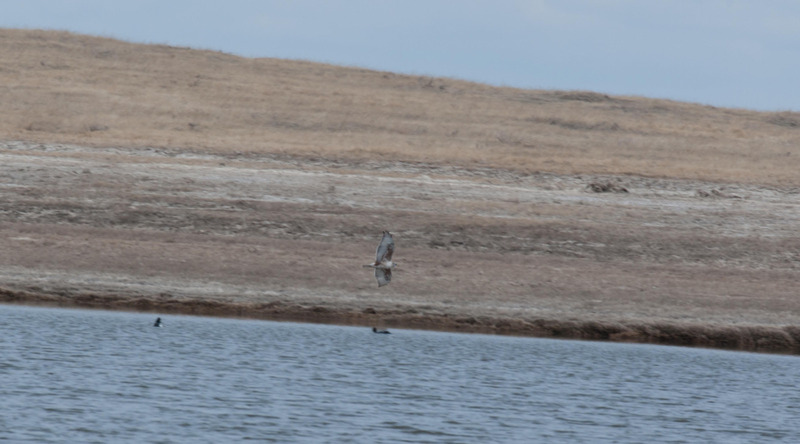 Other notable sightings during the day included American Kestrel, Sharp-shinned Hawk, Double-crested Cormorant and Snow Geese all near Kitsom Reservoir, and a pair of nesting Great-horned Owls near Namaka Lake. Now it's time for a break from birding! Happy Easter everyone! Prairie Birds and Prairie Dogs! A Full Day of Birding!